Much like I mentioned previously in my review of Pixel Puzzles: UndeadZ, puzzle games are so very common that they all practically require a unique addition in order to stand out. For standard puzzle games, the definition of what makes a puzzle game can wildly vary, allowing a great amount versatility by combining a basic type of puzzle game with whatever a creative team can think of. 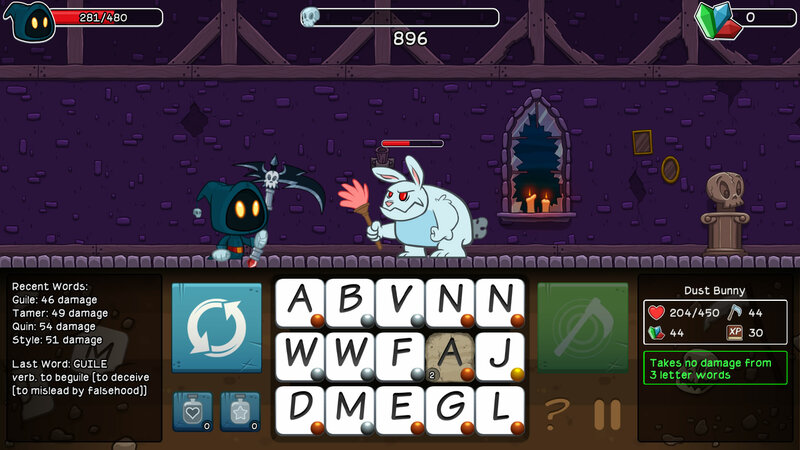 In the case of Letter Quest: Grimm’s Journey, developed by Bacon Bandit Games, it combines the word-spelling puzzle game (like Scrabble) with the RPG and action-adventure genres. I know it sounds like a mess from that description, but the truth is that it works quite well. Letter Quest: Grimm’s Journey starts out simple enough. You play as a grim reaper named Grimm (or the unlockable girl reaper Rose), who starts a journey across 5 massive areas to get pizza. Along the way, you must do battle with all kinds of monsters blocking your path. The way this works is as follows – you click letters that appear on the bottom of the screen in a 5-by-3 grid to form words of at least 3 letters’ length. Each enemy you vanquish drops gems, which you can use for either buying power-ups from the occasional in-stage merchant or buying RPG-style upgrades in the game’s store section. You also get gems for completing levels and as a reward for completing tasks on the in-game quest list. The game’s 5 areas consist of 40 total stages backed with an adorable art style and perfectly upbeat and intense music tracks. Each of the stages has 4 different modes of play. In addition to the normal stages, you have time attack modes, challenge modes in which you play with unique conditions (can’t do damage with words with more than 4 characters, all enemies have a certain special attack, etc. ), and a harder Crystal Star mode in which all enemies are at a higher level and all have unique special conditions. These 40 stages also include several challenging boss fights, and a few of the stages are hidden Hard stages including bosses. With the massive amount of replay value overall, the typical player would definitely find themselves coming back to each stage as they upgrade their equipment… And there are just so MANY upgrades to be bought and unlocked in this game. From increasing your health, to unique scythes with unique abilities, to equippable books that help you out with their own effects, there is a load of options for customization as you see fit. However, this ties into a big problem. The game isn’t without flaws. As the enemies get stronger, the gem rewards per level don’t quite scale with the difficulty. 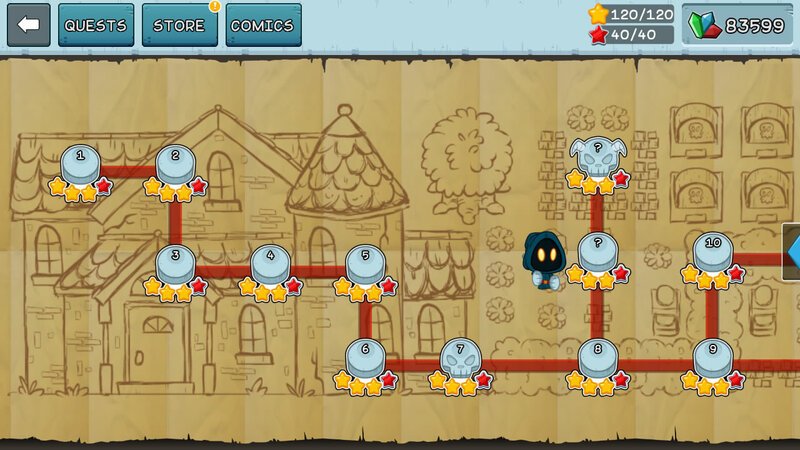 As a result, you eventually reach a point where you are forced to replay previous levels in order to get more gems to buy more upgrades, all just to progress along the main path. As with the typical grinding experience of RPGs, this can get really tedious really fast. Additionally, you would think that a letter-based puzzle game would offer keyboard support for quickly selecting from the available letters. Admittedly, I can understand not including it so as to be more inline with its Android and iOS touchscreen versions, but you can’t even use the arrow keys to select stages on the map and are forced to click-and-drag left or right just to find the stage you want to play or replay. All in all, Letter Quest: Grimm’s Journey is not just a pretty good puzzle game, but also a pretty good game period. If you don’t mind the RPG-style grinding and being stuck to using just the mouse, you’re sure to have a lot of fun playing, and that’s all that really matters. It’s not a perfect game, but it is surprisingly close. It’s just an utter delight and it can’t be recommended highly enough.